Multi award winning Browns Bonds Hill Group has announced a new partnership with AWARE – the national depression charity for Northern Ireland. The partnership will help AWARE make a real difference in supporting and educating more people on the illness of depression in the North West. Having recently been awarded Best Food Tourism Experience in Northern Ireland 2017, Browns is committed to providing the community with the finest cuisine in the North West at two award winning locations and Browns sought to support a charity throughout 2017 which has the community at its heart. They began their search for their first ever charity partnership in November 2016 and were inundated with applications from charities from across Northern Ireland. However, it was AWARE that secured this partnership. Browns Spokeperson, Chef Patron, Ian Orr, Browns Bonds Hill Group, said: “Since we opened our first restaurant in the city almost a decade ago we have helped a number of local charities but this year we wanted to develop an exclusive relationship with a local charity to assist in making a real difference in the local community. Colleen Milligan from AWARE said of the partnership; “We are delighted to be chosen as Browns first ever charity partner. This is particularly special for AWARE as we are a Derry born charity in our 21st year. We started off as a small support group in the home of Gerry Ward and now have an office in the heart of the city on Queen Street with 24 support groups throughout Northern Ireland. 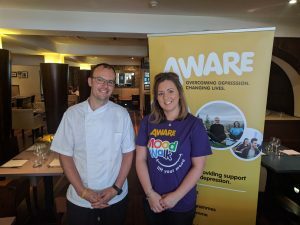 Staff from Browns restaurants on Bonds Hill and Strand Road will be helping AWARE to maximise income into the charity helping them grow their support groups and offer more young people in post primary schools the opportunity to access mental health and wellbeing programmes. As well as fundraising, Browns staff will be taking part in AWARE’s range of events throughout the year and offering their own staff the opportunity to avail of the charity’s Mindfulness programmes.